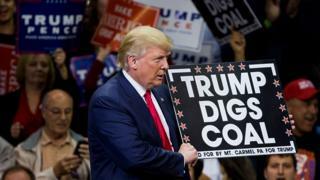 As a pro-coal president strides into the White House, the rest of the world is rallying in defence of the climate. Donald Trump has called climate change "a hoax" and filled his cabinet with representatives of fossil fuel industries. One of the world's leading climate scientists told me she was positively scared about his potential impact on the planet. But so far the leaders who joined with President Barack Obama in Paris in 2015 to sign the global climate deal are standing firm. As Mr Trump ponders pulling out of the UN climate deal, China, India, Germany, the EU and the UK have all reaffirmed their promise to curb CO2 emissions. And in the USA itself, moves have already been made to consolidate the low-carbon economy in a sign that fossil fuel companies will still face a battle over CO2 emissions, even with support from the White House. Only this week, China's President, Xi Jin Ping, warned Mr Trump that walking away from the Paris deal would endanger future generations. As Mr Trump promises to boost jobs by scrapping President Obama's clean energy plans, China is pushing on with a $361bn (£293bn) investment in renewable energy by 2020. China's green aspirations are undermined by its expansion of coal-fired power stations, but this week it also suspended plans for 104 new coal plants. Xie Zhenhua, the veteran climate negotiator who forged a close partnership on clean energy between the two mega-powers, told China Daily that the global momentum behind low-carbon technology was unstoppable. He was quoted as saying: "Industrial upgrades aiming for more sustainable growth is a global trend… it is not something that can be reversed by a single political leader. "The international community and US citizens will pressure the Trump administration to continue clean energy policies." What does the Paris climate agreement mean for me? The State Department may not dismiss this flippantly: while US-Chinese relations may be increasingly frosty in many areas, climate change and clean energy remain a valuable sphere of co-operation. American politicians may also be wary of watching China seize the moral heights as world leader in tackling climate change. India is also standing firm. Its energy minister, Piyush Goyal, said this week: "We respect the fact that America has chosen its leader. "However, clean energy is not something that we are working on because somebody else wants us to do it - it's a matter of faith and the faith of the leadership in India. "Nothing on Earth is going to stop us from doing that." Solar energy prices are now on a par with coal in India, which boasts the world's biggest solar farm and the first chemical plant to eat its own CO2 emissions. It will continue to expand coal-fired generation for the next few years, but its National Electricity Plan projects no further increase in coal-based capacity after 2022 - much earlier than previously suggested. Dollars, technology and jobs will pour into clean energy in these countries, and the USA will surely be keen not to miss out. Meanwhile, moves are being made to consolidate President Obama's climate legacy. The US previously pledged $3bn to the UN's green fund to help poor countries adapt to climate change and get clean technology. Mr Trump won support among some voters for promising to stop payments and spend the cash on American citizens instead. But this week President Obama slipped the fund a further $500m. And it won't just be on the international stage that Mr Trump's team will face fossil fuel battles. Some early skirmishes on American soil are already under way. This week, the Environmental Protection Agency cemented stricter efficiency standards for cars. Republicans will try to reverse this - but when carmakers previously resisted efficiency rules, they ended up producing such uncompetitive gas-guzzlers that the industry had to be bailed out. Even Republican plans to boost extraction of fossil fuels, while popular in some states because the industries create jobs, will provoke local resistance from people who don't want oil pipelines, or don't want the tops blown off their mountains to get to coal. It may be hard to persuade investors to put cash into coal anyway. Many states will resist fossil fuels, too. California has long led the way on car emissions and recently insisted it will keep its right to set its own tighter regulations for cars. Mr Trump's team may try to rescind this. There are already CO2 trading schemes between states on the east and west coasts, and last week New York Governor Andrew Cuomo announced plans to build enough offshore wind capacity by 2030 to power 1.25 million homes. Here's the big picture: as the world moves together to tackle climate change, it is clearly problematic if the biggest historic polluter threatens to pull in the opposite direction. Will Angela Merkel, for instance, be so sanguine about Germany's controversial switch to renewables if the US forces its already-low energy prices even lower, triggering protests from German industry? In the words of Jo Haigh, professor of atmospheric physics at Imperial College, London: "If Trump does what he said he'd do, and others follow suit, my gut feeling is that I'm scared. Very scared." But he may not. And they may not.